What did the judges just do? The judges reviewed and disagreed with the prosecutor’s decision not to open an investigation into the 2010 flotilla raid and requested that she reconsider her decision. So does the prosecutor have to open an investigation now? 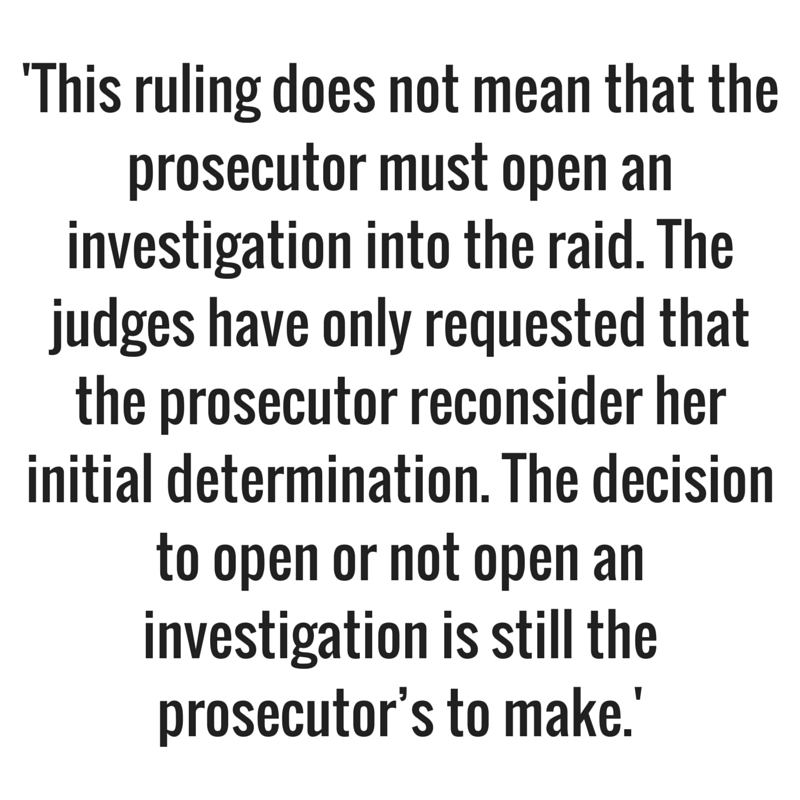 No, this ruling does not mean that the prosecutor must open an investigation into the raid. The judges have only requested that the prosecutor reconsider her initial determination. The decision to open or not open an investigation is still the prosecutor’s to make. Why did the prosecutor decide not to open an investigation in 2014? After conducting a preliminary examination into the matter, the prosecutor determined that, although there was a reasonable basis to believe that war crimes were committed during the flotilla raid, the potential cases arising from the situation were not of sufficient gravity to warrant further ICC involvement, and so declined to open an investigation. Why do the judges disagree with the prosecutor? In their ruling, a majority of judges decided that the prosecutor should have determined that the cases potentially arising from the flotilla raid could be of sufficient gravity to justify an investigation. In particular, the judges said that the prosecutor should reconsider her determination that the evidence available to her shows that the scale, nature, manner of commission and impact of the alleged crimes, in addition to the possibility that those most responsible for the alleged crimes would be prosecuted, could meet the court’s gravity test for opening investigations,. Gravity is one of several factors the prosecutor must consider when deciding whether to proceed with an investigation. The ICC was founded to adjudicate the most serious crimes of concern to the international community, and the prosecutor has to be selective in deciding which situations to pursue. In addition to determining whether crimes under the ICC’s jurisdiction were likely committed and whether the relevant national authorities are carrying out their own investigations into those crimes, the prosecutor determines whether the alleged crimes are serious enough to merit the Court’s involvement. Why did the judges review the prosecutor’s decision? In short, because the Comoros asked them to. The flotilla raid was referred to the prosecutor by the Comoros, the state where the Mavi Marmara—the ship where the alleged crimes occurred—was registered. Under the ICC Rome Statute, when a state asks the ICC prosecutor to investigate a situation, the choice to open or not open an investigation is always up to the prosecutor. However, the referring state can ask the judges to review the prosecutor’s decision if they disagree with it, which the Comoros did in this case. The prosecutor can do a number of things. She could now revisit her initial decision and stick to her determination not to open an investigation, or decide to open an investigation. She may also consider the possibility of appealing the judges’ decision. In any case, the decision to open or not open an investigation into the flotilla raid will be hers alone to make. Want more? Sign up for our weekly and monthly email updates!